The schemes for enhancing the attraction of St.Annes as a residential and visiting resort came before a special meeting of St. Annes Council on Monday afternoon. Competitive designs were invited for laying out St. George's Gardens, for which premiums of £50 and £25 were offered; and designs were also invited for laying, out the North Esplanade and foreshore, for which similar premiums were offered. Competitors were limited to an expenditure of £10,000 on each of the two schemes. The members of the Council spent the afternoon in discussing the merits of the schemes and plans submitted, and awarded the first two prizes to Mr. Fred Harrison, of Lytham and Accrington, and the two second prizes to Mr W. R. Sharp, of St. Annes. The prize-design provides for converting St. George's Gardens into a pleasure garden and a recreation ground, constructing marine boating lake, bathing pool and paddy big pool on the shore, and laying out North Promenade in parterres, with a lower walk. Mr. Harrison, in developing St. George's Gardens, has endeavoured to preserve to the uttermost, the present features and yet use the land to the best advantage. He has kept in mind the fact that tennis and, other games will be in much demand, and has provided twelve tennis courts of standard size; two croquet lawns, 100ft. by 90ft., and pavilions, disposing them so as to entail the smallest cost in construction and maintenance; a bowling green, 120ft. by 90ft. at the north end of the grounds with a bowls’ house and all the usual equipment. The tennis and croquet lawns and bowling greens would be sheltered from the road by a banking of rockery and shrubs and pergolas. Near the centre of the gardens is an amphitheatre band stand of rustic design, with thatched roof and a base of rubble stone. The existing pond at the north end of the gardens would be converted into an ornamental lake with a fountain. The main entrance to the Gardens will be from Clifton Drive, through very handsome gates, and a pavilion in the English Renaissance style of architecture, will front the entrance. This pavilion, which will be of steel and reinforced concrete, will have open verandahs on each side. It will contain a concert hall, 110ft x 50ft., to seat 850, and capable of extension; a stage 40ft. by 30ft; and ample cloak-rooms and dressing-rooms. Behind the stage will be a retiring or supper-room, 35ft. by 30ft. Other spaces will be laid out with garden plants in geometric designs with rustic pergolas and semi-circular kiosks for those who desire to sit at their ease. The cost of Mr. Harrison's scheme for St. George's Gardens is £5,834. In laying out the foreshore Mr. Harrison proposes to take advantage of the "stanner" and construct a marine boating lake half a mile long and 75 yards broad, with islands dotted in the water. Opposite the lifeboat slip will be a bridge across the lake, the centre section of which can be raised to allow yachts to pass under. On the outer side of the lake will be a promenade wall, and sluice gates are provided to admit the tide. Close to the bridge is an open-air swimming bath, 100yds. by 40yds., varying in depth from 6ft. 6ins. downwards. Ample accommodation is provided for dressing-rooms and a refreshment room and there are also spectators' galleries. At one end of the bathing pool will be a children's paddling pool, and on the shore side of the water will be a children's playground on the sands. The supply of sea-water to the bath will be maintained by an electrical pumping station, which will also feed a main to the town, and save the money now spent on water for street watering. The cost of the swimming baths is given as £4,500; the lake £3,960; laying out the foreshore, £640; and the slipway and jetties, etc., £356. 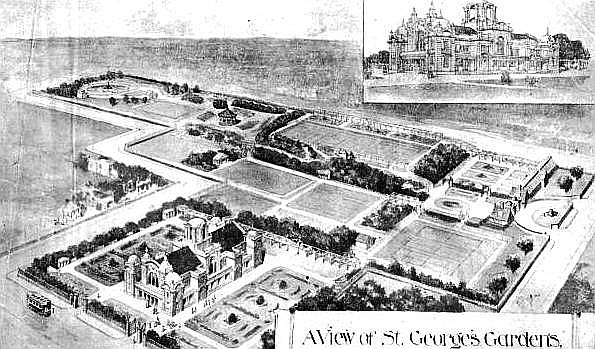 Mr. W. R. Sharp's scheme for St. George's Gardens was with the idea of making the gardens a place of recreation for young people, and a central place of attraction for visitors and residents. The main entrance would be from Clifton Drive, with a supplementary entrance from Beach Road. The pavilion would be on the main promenade and accommodate 600, being capable of extension to seat 1,000. There would be eleven tennis courts, a croquet lawn and bowling green, with shelters in different parts of the gardens. A feature would be a natural and rustic section. The estimated cost was £10,000, but the scheme could be taken in parts. On the shore Mr. Sharp proposed a marine lake, half-a-mile long and 250ft. wide, close to the inner Promenade, from Fairhaven Road to the Pier. A bridge over the lake was shown at Eastbank Road, and an outer Promenade, 30ft. wide. There would also be an open-air swimming bath, 250ft. by 120ft., with every accommodation for bathers and spectators. The cost was estimated at £10,000. At the meeting of the Council, on Monday, Councillor Cooper said it was not intended to carry out the whole of the plans immediately, even if they got the powers were seeking. The scheme simply indicated the general lines on which, in future they proposed to develop the gardens, but were unanimously of the opinion that could be done gradually, and as the finances permitted.